Dadabhoy Institute of Higher Education (DIHE) was set up in the year 2003 by Dadabhoy Foundation. The institute received its charter from the Government of Sindh in 2003. It has been recognized by the Higher Education Commission (HEC) and ranked as “W” (A) category educational institution. Since its establishment, the Institute has imparted high quality education at undergraduate and graduate levels. Over the years, DIHE has been able to carve out a significant niche for itself amongst institutes of higher learning in Pakistan. It has introduced a number of programs for M.Phil and PhD studies in the Faculties of Science, Law, Education, Computer Science and Business Administration. Attempts have been made to set high standards of research by introducing national and international levels courses delivered by foreign qualified faculties. The rules and regulations for the award of degrees as set out by HEC have been implemented after the approval of competent Regulatory Bodies of the Institute. Research articles produced by the students and the faculty members of DIHE have been published in International, refereed journals. Dadabhoy Institute of Higher Education is committed to become one of the leading centers of Higher Education in Pakistan while serving the intellectual, cultural, social, environmental and economic needs of the country. As a result DIHE will cause human development through its educational programs, research initiatives and outreach efforts. DIHE is devoted to discovering, disseminating and applying knowledge for the advancement of the Pakistani Society in the perspective of global changes. DIHE identifies and attracts undergraduate and graduate students of high potential, especially those who have been historically under-represented because of limited financial resources. Through commitment to excellence in teaching and educational services, DIHE prepares students for lifelong learning and for constructive participation in the community. Community service and giving back to the nation is part of life at DIHE. 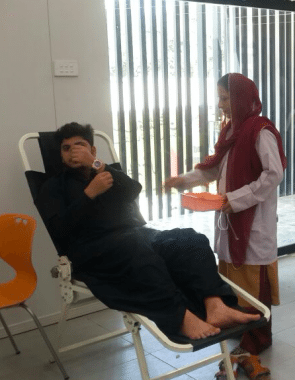 Over the years DIHE has collaborated with many healthcare and government as well as non-governmental organizations providing free basic healthcare services, holding awareness sessions about energy conservation, personal hygiene etc. The students undergo min 1 credit hour compulsory community service course during their stay at DIHE. DIHE has signed MOUs with around 38 such organizations. Students are required to spend time in the field, identify a problem, and work individually or in teams to find solutions to the local problems. Recently, MPhil and PhD group from the Clinical Microbiology and Immunology department carried out a research project on diseases transmitted to milkmen from unclean udders if buffaloes, and from them to the consumers. Free vaccination campaign is carried out by students of department of Epidemiology and Public Health for hepatitis B and C vaccine injections.